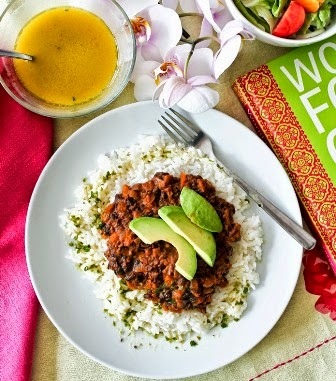 Served with Mexican Rice, Potato Salad and Sweet Iced Tea - hello summer! 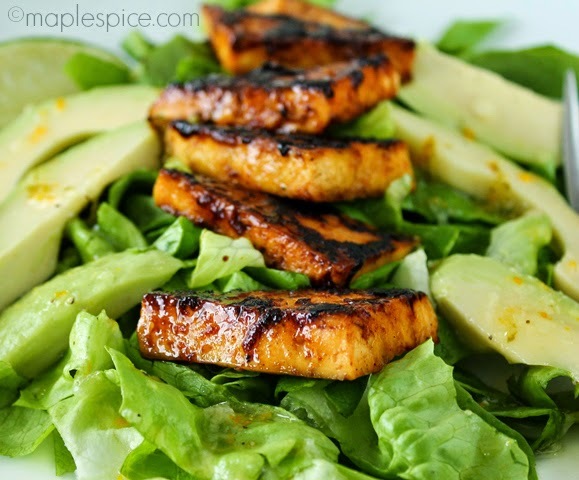 Served as a lighter meal on top of some nice lettuce with slices of avocado and a drizzle of the marinade as a dressing. For those of you not in Ireland and the UK it is a VERY soft tofu, bordering on silken in many ways. I do love it but it's softness can be a let down in some cases, particularly in marinating. 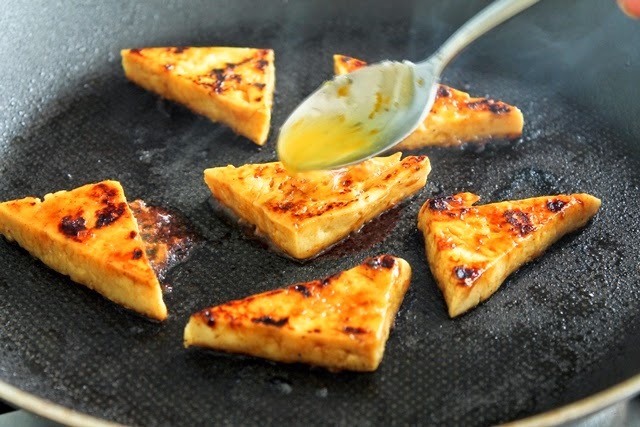 Obviously when marinating you want to extract as much of the liquid as you can from the tofu, usually by pressing so that the tofu will absorb all your yummy marinade. 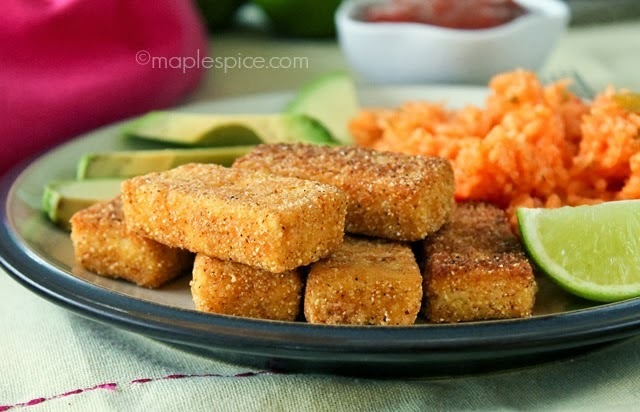 This tofu is so soft it gets a little smashed when you press it. Not good. So I was looking for a way to draw out the liquid without pressing (or freezing as it takes too long) - enter, the microwave. 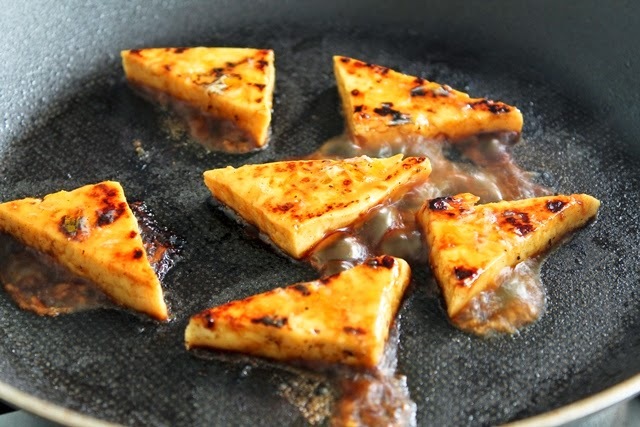 I simply cut the tofu as I wanted, in this case thin-ish triangles and placed them on a plate. Microwaved for 1 minute then placed them on paper towels to drain. Wiped the plate clean of all the water that came out and repeated the process so that it was microwaved a total of 4 minutes. In the end you end up with a much firmer and bouncier tofu with almost all the liquid extracted - perfect for marinating. This does 'cook' the tofu slightly but I find that only enhances the texture again. Plus, you are then marinating the tofu while warm which I find makes it absorb even more marinade. 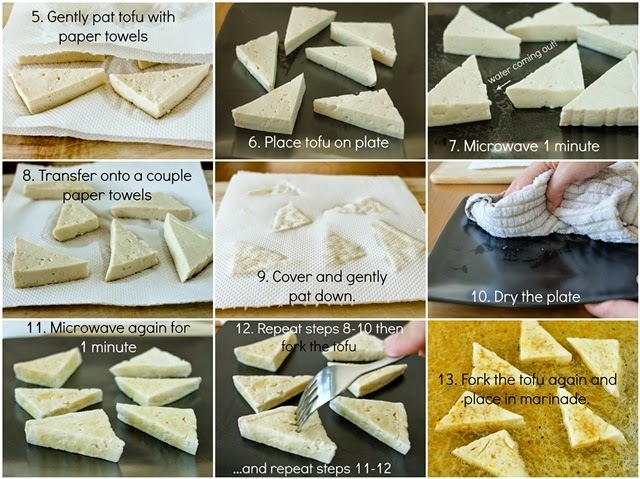 ♥ If using soft or very soft tofu then follow my microwaving procedure below. 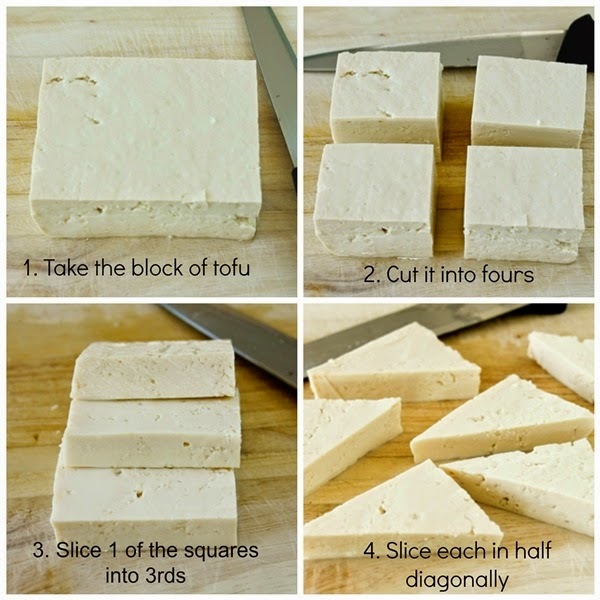 ♥ If you are using a firm tofu, simply press the cut tofu between layers of paper towel or a clean kitchen towel for about 15 minutes, change the paper at least once, then marinade as per recipe instructions. ♥ Depending on your microwave you may not need the full 4 minutes, or you may need more. Stop when there is very little water being released by the tofu and it feels firm, bouncy and dry-ish. ♥ The 1 tsp of salt is not a typo! As this is a marinade all of that won't be used and you do want a little salty kick here, just like in a margarita :-) Besides, even when I use it as a dressing it's not too much. 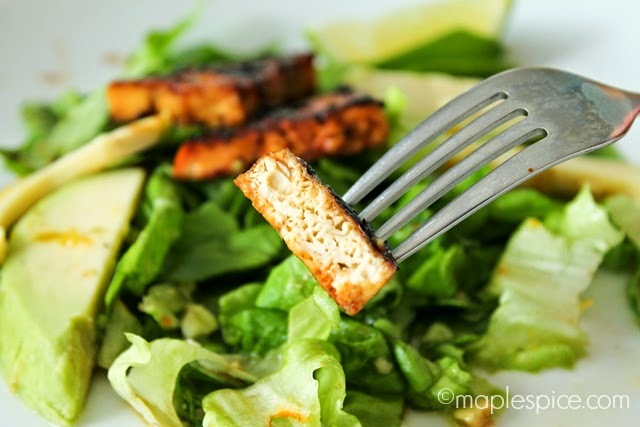 ♥ Marinade makes enough for 2 lots of tofu (250g) but I've written this up to serve one. 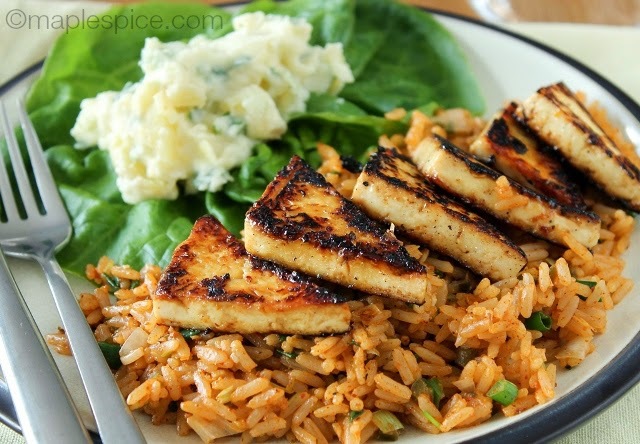 Leftover marinade will keep in the fridge for a couple of days or you can double the amount of tofu here to serve 2. 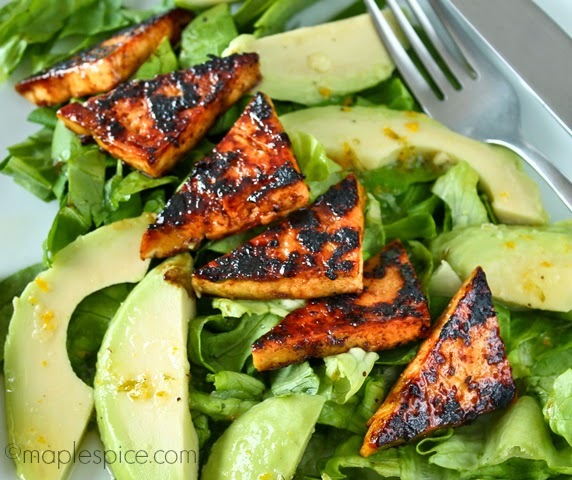 For the marinade simply whisk everything but the tofu together and tip into a container that will fit all the tofu in a single layer. 1. 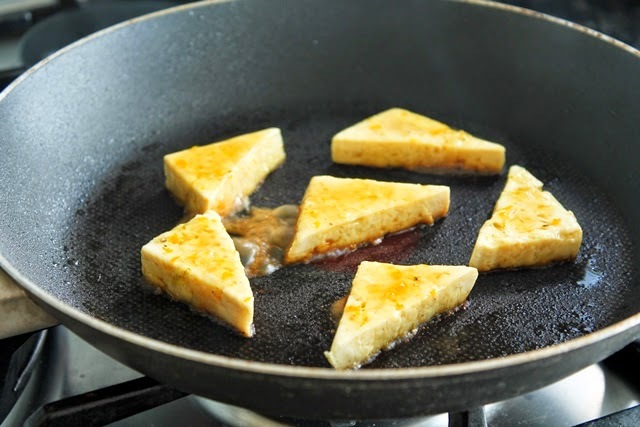 Take ¼ of a pack of Cauldron’s Soft Tofu and slice into 6 thin triangles. 2. Place on a plate and microwave on high 1 minute. 3. 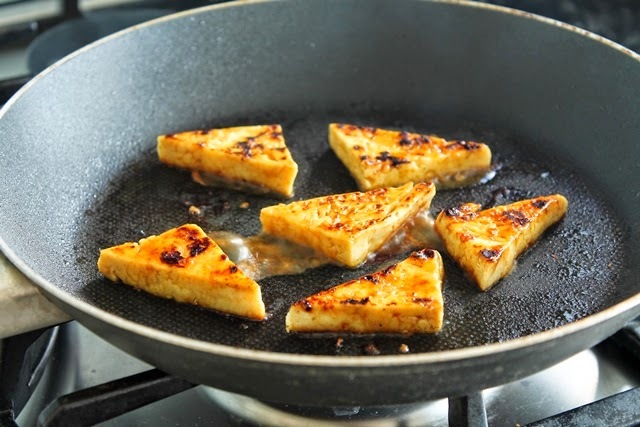 Transfer the tofu onto 2 sheets of paper towel and place 1 more on top, pat down gently to absorb water. 4. Dry the plate and return the tofu to it. Microwave again for 1 minute. 5. Transfer to 2 sheets of paper towel and place 1 more on top, pat down to absorb water. 7. Transfer to 1 sheet1 of paper towel and place 1 more on top, pat down to absorb water. 8. Dry the plate and return the tofu to it, poke the tofu with a fork, both sides. Microwave again for 1 minute. 9. Transfer to 1 sheet1 of paper towel and place 1 more on top, pat down to absorb water (there should be very little water at this point). Poke again with a fork on both sides. 10. 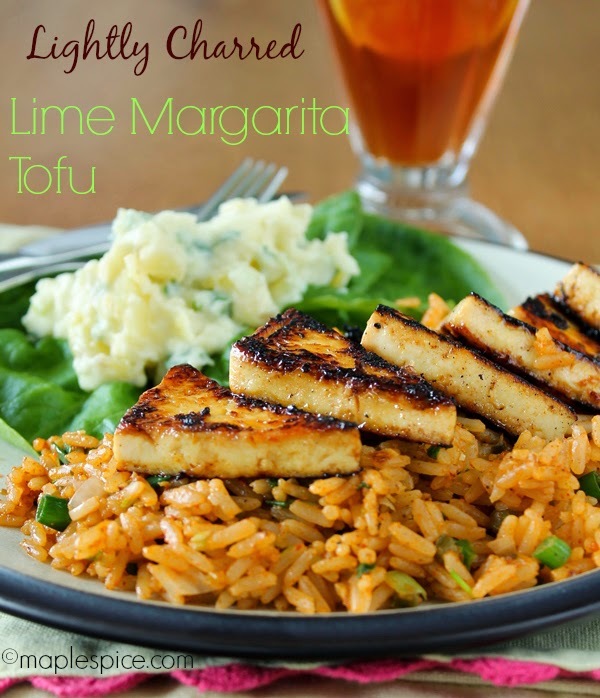 Place the prepared tofu into the marinade, cover and refrigerate for 1 hour to marinade. ...and let it sizzle away! 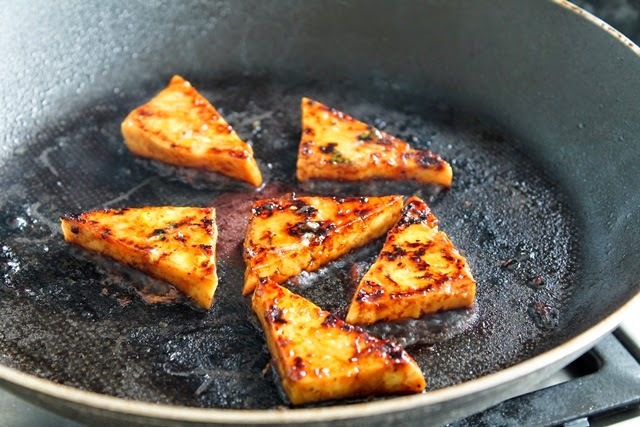 Flip the tofu over and spoon a little more marinade over, again let it sizzle away. I now just let it cook, flipping them over until I'm happy with the amount of charred bits I've got on both sides. Then, just serve as you like! 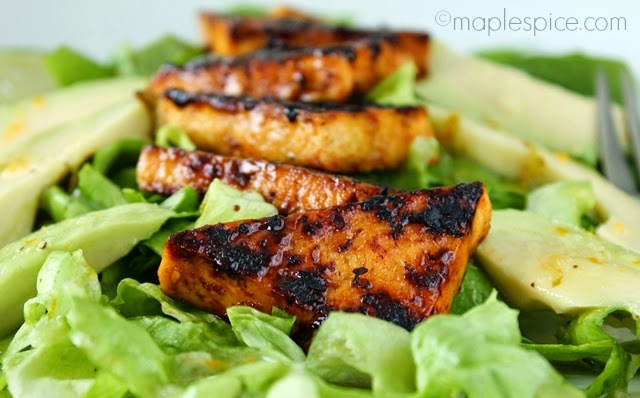 I liked this both ways - as a larger, heartier meal with Mexican Rice and Potato Salad (basic version) and as a lighter salad simply with a nice leaf, avocado and the marinade as dressing. This sounds delicious. Perfect summer supper. Interesting technique for the tofu too. 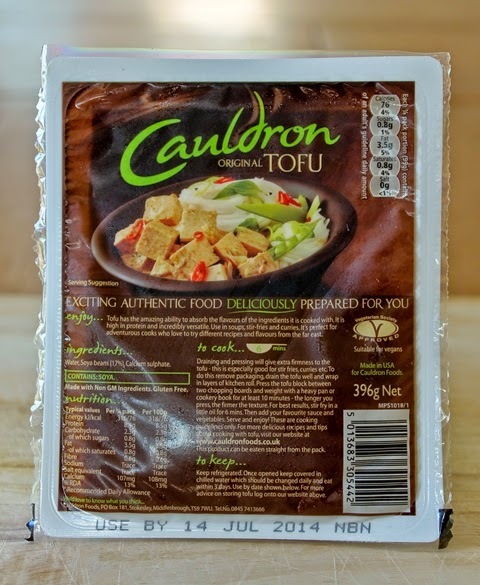 I use Clearspot organic tofu (you can get it from independent health food shops) and I think it is a little firmer than Cauldron anyway, but the firmer the better.